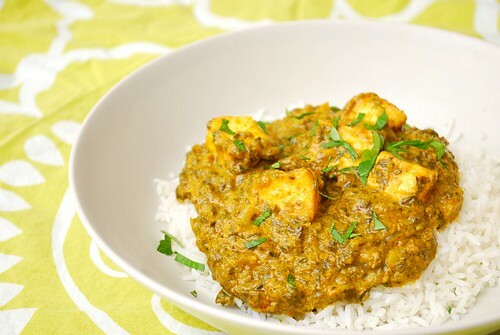 So what exactly is Palak Paneer? This is a dish that consists of spinach, spices and bite sized farmers cheese. It's the kind of dish that's comforting when served over rice or even with warm, buttery naan bread. However you enjoy it, it's certainly a common dish of Indian cuisine. Most might assume there would be a long list of spices to make various Indian dishes. This recipe calls for ingredients that are fairly common at most supermarkets and you may already have most in your pantry. Paneer cheese may be trickier and if that cheese isn't available, you can substitute it with ricotta cheese and stirring it in. In a large saucepan heat 3 tablespoons of olive oil and saute garlic, 1/2 tablespoon of ginger, red chilies (optional ingredient) and onion until brown. Mix in the cumin, coriander, turmeric and Greek yogurt (add more or less to achieve desired creaminess). Add the spinach, handfuls at a time until it is cooked down, about 15 minutes total. Remove from heat and allow to cool slightly. Pour spinach mixture into a blender or food processor, the remaining 1/2 tablespoon of ginger, and cilantro (add more or less according to taste). Blend for 15 to 30 seconds, or until the spinach is finely chopped. Pour back into the saucepan and keep warm over low heat. In a medium frying pan heat 3 tablespoons of olive oil over medium heat, and fry cheese until browned; drain and add to spinach. Cook for 10 minutes on low heat. Season with salt to taste. Is this the same as Saag Paneer? It looks the same and is my favorite Indian dish. Can't wait to give this a try! Sounds fun, I've cooked Palak Paneer in the past but never got it to a level I'm happy with (which is sadly true of all Indian dishes I've tried). Why is it yellow and not green though? How Americanized have you made it! Or is this a variant of palak paneer I've just never seen. Anonymous - love the suggestion, Thank you! I'll have to try that for next time. David - The yellowish color is probably my lighting, but I added a slightly heaping teaspoon of turmeric versus an exact teaspoon. Hey anonymous is me Pooja from the Shoreham!!! How are ya? Christine - Palak and Saag are very similar. Palak is spinach whereas Saag is more like mustard greens, that's much more bitter. Both are prepared similarly... just the type of greens used are different. The directions mention adding tomato, but there's no tomato listed in the ingredients. Could you clarify? I'd love to make this! Anonymous - thank you for catching that! The original recipe (linked above) included tomato but I omitted it with my adaptation. I've updated the directions to remove the mention of tomato. Thanks!